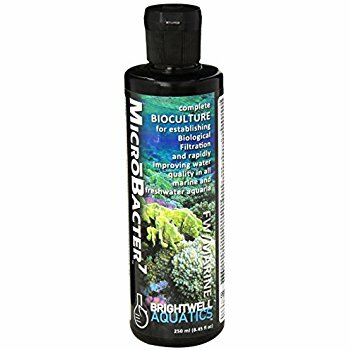 Complex system of non-pathogenic aerobic and anaerobic microbes, as well as natural enzymes, specifically formulated to establish biological filtration in new aquarium set-ups, and to enhance the rate of nitrification, denitrification, and organic waste degradation in marine and freshwater aquaria through complete nutrient remineralization. Supplied in a state of suspended animation for maximum longevity. 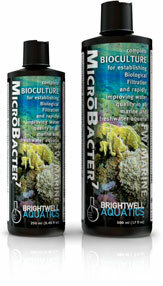 Formulated utilizing extensive data compiled by microbiologists. 1. Rapid reduction of organic carbon, ammonia, nitrite, nitrate, and phosphate. 4. Greatly-reduced hydrogen sulfide production. 5. Increase in dissolved oxygen concentration. 6. Limits availability of pre-existing phosphate to undesirable forms of algae and cyanobacteria. Genial sak både til oppstart og vedlikehold..